Sometimes I find it hard to fit in the recommended daily portions of protein into my diet – after seeing a nutritionist at the beginning of the year, it became clear that what I thought was a healthy diet was actually laden with sugar, refined carbs and very little protein. Having been obsessed with Weight Watchers points for nearly two years, it was difficult to let go of the meticulous tracking and counting to concentrate on food groups and getting the right portions – even though I was keeping within my daily allowance I was no longer losing weight and was getting regular sugar crashes throughout the afternoon. My food diary showed some days I was only eating one portion of protein instead of my recommended four. I was living on toast and marmalade for breakfast (two slices of those mini bread loaves, no marg and just marmalade, a very WW friendly way to do it), salad and snackajacks for lunch and a big dinner in the evening, with several portions of fruit and a couple of cereal bars as snacks, so no wonder my sugar highs and lows were so prevalent. Even though nowadays my diet is much healthier, (and yummier), I still sometimes struggle to get my recommended portions of protein, and have been looking at protein supplements for a while. 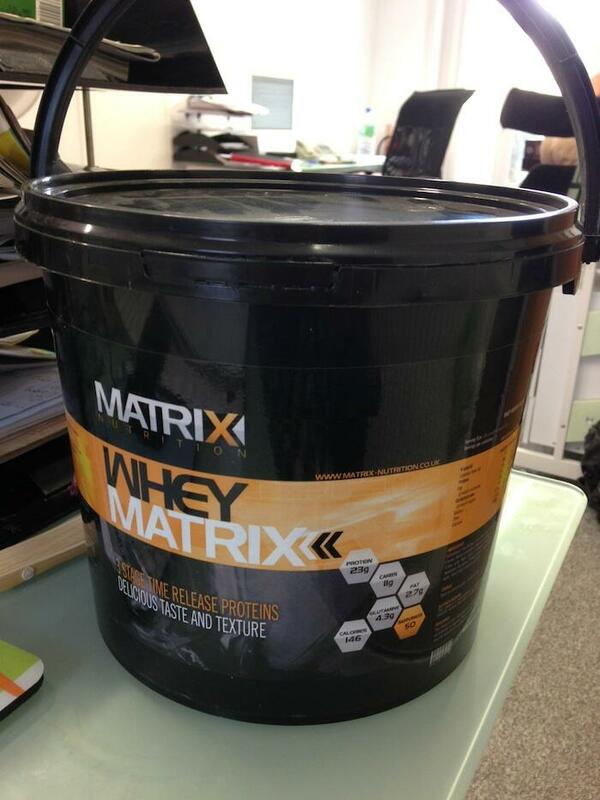 As if they read my mind, the Supplement Centre got in touch to see if I’d like to try some Matrix Whey Protein powder and kindly sent me my very own 2.5kg tub full. I chose vanilla flavour as I could add it to various recipes and use it as a base for other smoothies and shakes. The Matrix Whey is made from a combination of protein, carbohydrates and glutamine, so is ideal as a post-workout recovery drink, but can also be used as a pre-workout energy booster and meal replacement. I personally wouldn’t choose it (or any other shake for that matter) as a meal replacement as I don’t see it as a substitute to food but a supplement to my diet and exercise plan. I love having a shake after my runs and evening bootcamp sessions to help with recovery and refuelling – when made with milk the powder makes such a tasty and creamy shake, it’s a real post-workout treat that I always look forward to. I’ve been thinking of trying it with almond milk too, and am already hunting out the chocolate flavour for when I run out. I did try it with water but it wasn’t as nice, so now I always have it with milk. I’ve seen chat on the Twittersphere of mixing protein powder with hot milk to make a hot shake too – although this was with the chocolate powder so I’ll save that idea for my next tub of protein goodness! Do you use a protein supplement? Do you have any nifty recipes or ideas to use it with?